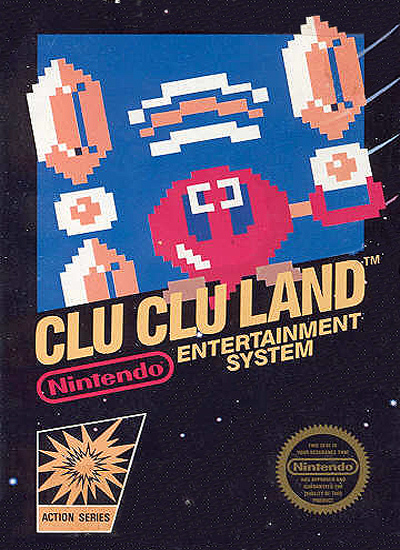 When you think of games being under the sea, you may think of such timeless classics as Jaws or the underwater stages from Super Mario Bros, but one of the more unusual games that was released based underwater was Clu Clu Land. Although there isn’t a blue pixellated drop of water in sight, and no sailing boats full of tanned tourists, how does this game released 25 years ago fare up today? Is it ships ahoy to golden treasure or does it deserve to buried deep in Davy Jones’ locker? 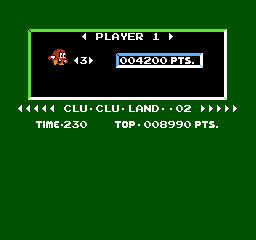 Clu Clu Land, or Kuru Kuru Land as it could of been named in Japan (Kuru meaning to go “around”, so literally could have meant around-and-around Land but we won’t confuse matters here) is a game in which you control Bubbles who looks quite cute and adorable, as much as once can when you look like a tomato with a propeller at its rear. The aim of the game is to swim in a square-type level uncovering gold treasure by swimming over them, whilst running away and destroying the 2 enemies on the screen and not falling into the black hole that is ever present on the screen.. There is a certain target of coins to uncover, which is displayed on the top left of the screen. Collect the target and you move onto the next level, where the levels get faster and harder. So how on earth do you move around? Well pressing the corresponding d-pad button moves Bubbles in the direction, and when she turns, she holds onto the fried eggs on the screen, I mean “poles”. If you hold the button down, she will keep spinning around and around – hence Kuru Kuru ergo Clu Clu Land. It’s always nice knowing how titles of games come around isn’t it? Anyway, Bubbles will spin on these poles until you release the button so off she swims. Pressing the A or B button launches her sole attack – a sonic wave that turns the enemies into a ball that you can push off the screen for extra points. If you get touched by the enemies, or fall down the holes then you lose a life. You can also lose a life if you run out of time, with the time remaining being displayed on the top of the screen Like most of the black box games there isn’t an end game screen but getting a high score. Once again though a drawback is that when you turn the console off the high score doesn’t save, so take a photo as proof of your million point score. Extra points are on offer for collecting the various on screen bonuses similar to Pac-man to help bump up your score. Pucker up and kiss the screen! 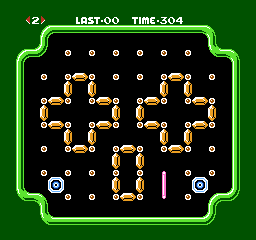 When you run over a part of the level to uncover a coin (in later levels you need to run over the same spot twice to uncover the gold) it remains on the screen, so it’s easy to see the patterns being displayed on the screen and see where you need to aim for to complete the pattern and complete the level. If you look carefully and know your Nintendo games, you may recognise the gold treasure as the rupee coins from The Legend of Zelda, which is a nice tip-of-the-hat to this game. However there are some negatives to the game, one of them being that Bubbles moves rather quickly, so when your spinning around and around a pole or whizzing along, you need to have fantastic reflexes, otherwise its somewhat easy to lose your life. You do get 5 lives but they do run down quickly with black holes and the enemies, and when you first start the game the controls do take some getting used to, its hard controlling Bubbles and making her go the direction you want. In terms of graphics, the colours are bright and bold with rupees from Zelda and poles that look suspiciously like fried eggs and menacing looking sea urchins skulking their way across the screen. Each level the colours change, so it doesn’t feel like Urban Champion where the same pastel colours were regurgitated so it didn’t feel different between levels. The music is jaunty and the sound effects do sound great, when you fire your sonic wave and uncovering the coins. Typically 8-bit in style the sounds are not annoying enough where you would play this game with the sound off. The controls, well they’re good, but not great. Although simple, the fact that Bubbles darts over the screen and when your turning you collide directly with the enemy, you need to get to grips with the controls quickly otherwise you won’t get far in this game. If you remember from the last review, in which souls were sacrificed just to get through to the other side, we discussed how the game was made by the same folks who brought us Goldeneye and Banjo Kazooie – Rare. Maybe it is with a sense of British pride and biased from myself that they made some great stuff, however they also made some absolute spawn of camel’s discharge, a shining example of this being “Anticipation”. *Shudder* But where did it all begin for Rare, was there a big-bang type event or a spin-the-bottle evening with blue-sky paradigm-shifting business-waffle speak ideas? 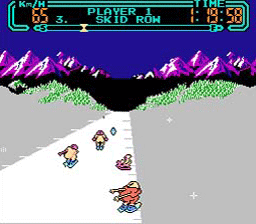 Well, in the UK at least back in October 1987 here it is where it all began, with this game – Slalom for the NES. So nearly 25 years on, how does this game developed by Tim and Chris Stamper fare up, will it leave you wanting to book your next holiday in Aspen or leave you feeling “piste” off? 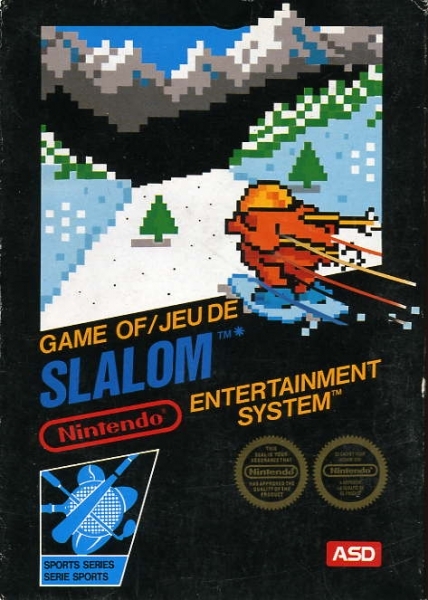 Slalom is a skiing game in which the character who looks suspiciously like a cooked turkey on the box and in the game, has to ski his way down 3 different types of slopes in varying increasing difficulty, skiing past flags, dodging mounds in the snow and other seemingly suicidal middle-class pretentious skiiers and sledders who really can’t ski but try to keep up with Joneses eating their Gruyere sipping Cabernet Sauvignon in their wooden lodges…ahem sorry about that… The course has to be completed within a certain time limit, to which you progress to the next level so your skiier has to dodge these obstacles or face the risk of losing time and not completing the course, which is pretty much all there is to the game. When you start the game you get the choice of 1 or 2 players, before then choosing the slope you wish to start from – Snowy Hill, Steep Peak or Mount Nasty, names that wouldn’t seem out of place in adult films or WWE characters. Snowy Hill is the beginner course, Steep Peak intermediate and Mount Nasty living up to its title. For veterans of the game, it is a nice feature that you don’t always have to start from the very beginning and can choose which course to start from. 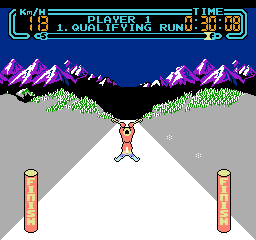 As the levels progress, aside from dodging the obstacles on the run, the player needs to ski in between the flags like a slalom (hence the name of the title), which if you miss these flags will slow your speed down. 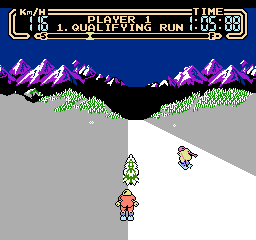 Your speedometer is in the top left hand corner, the time remaining in the top right, and just below that a progress bar showing how far you’ve skiied and what is remaining. The game screen is nice and big, and you get to see what is coming in front of you, giving you time to dodge the obstacles. On later levels, when your hurtling down at 180km/h, your reaction times need to be like that of a raccoon eating left-over ice cream, as those obstacles come thick and fast with any hint of hesitation or missing the flags, will make you crash or slow your player down, costing valuable time. The controls are fluid and responsive, holding up on the d-pad will make your skiier travel faster, holding down slows him down, left and right makes him turn the respective ways and the A/B button causes him to jump. It is written that you can do tricks when your character is in the air, however one of the disadvantages of buying just cartridges and not manuals for games is not knowing the full set of controls. The graphics are reminiscent of a VGA-hue from the 1980’s on PC’s, with purples and cyan’s all over the palette. There are some nice touches with the mountains looming in the background and the snow-capped green forests in the distance, it makes you feel like you are lost in the Alps skiing your way down. The music is very catchy and is a nice soundtrack for your run, lesser games and companies would have just had no sound and bad sound effects, but David Wise did a fantastic job with the music on the game which after a while you’ll be humming long after you’ve turned the console off. Just before the review, a huge thanks to everyone who has contributed to Review A Bad Game Day, to @nintendo_legend and to 1 More Castle for organising the day, to all the retro guys on Twitter and to everyone reading this – many thanks! Board games are designed to be played round tables in log cabins, fire roaring, warm cocoa in china mugs, snow falling outside, families arguing that the dice wasn’t rolled properly. Well in my mind that’s what it should be, albeit with cheesy music in the background. Board games should not be played on consoles in lieu of Mario, Sonic and all our favourite characters. 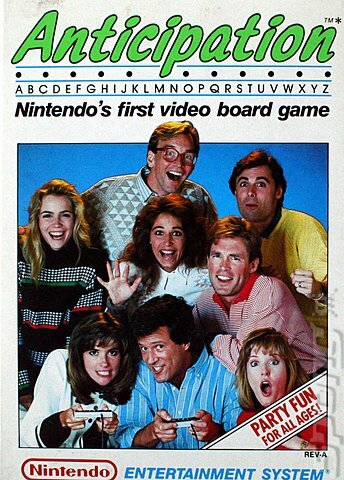 But this is what Rare did in 1988, proclaiming Anticipation to be “Nintendo’s first video board game”. Being the first doesn’t mean it’s bad in anyway, look at Back to the Future, but did it set a high bar for generations to follow? Anticipation is a set like a board game, the purpose of which is to guess the pictures being drawn on the screen in a dot to dot fashion. If you know what the picture is, you have to guess the word to win the piece and move up a level. Complete the levels to win the game. It really is that simple. And that dull. 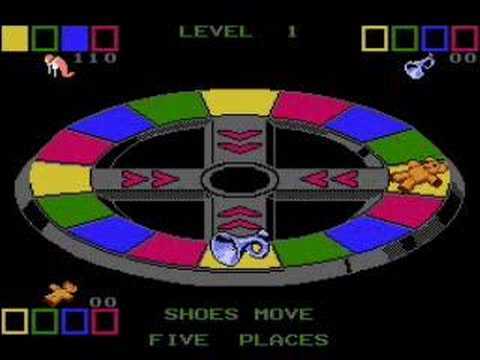 Turning on this bad boy, after waiting what seems like an eternity to press start to skip to the menu and mashing the controller in the process, your presented with the option of selecting the number of players between 1-4, that’s represented by a teddy bear, horn, shoes or a duck-looking ice cream. Then selecting the computer players, and then finally the skill level from Easy through to very hard and then your on your way. The main difference in difficulty is that very hard for example you don’t even see the dots, you have to guess from the movements what the computer is drawing, which defeats the idea of a dot-to-dot game. I’d rather watch my 3 year old nephew high on e-numbers go crazy on an easel with paint and crayons. It’d be easier to guess what he’s drawing compared to this game. 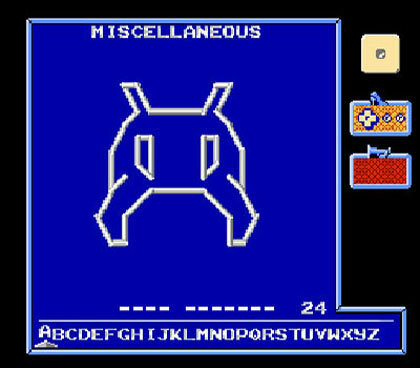 On the game screen you have to guess the word what is being drawn ever so slowly in a dot-to-dot fashion (to which they’re not numbered – a crime against all dot-to-dot puzzles). If you think you know what the crudely-drawn picture is, press the A button to bring up the letters along the bottom and type in the word, again oh so slowly. 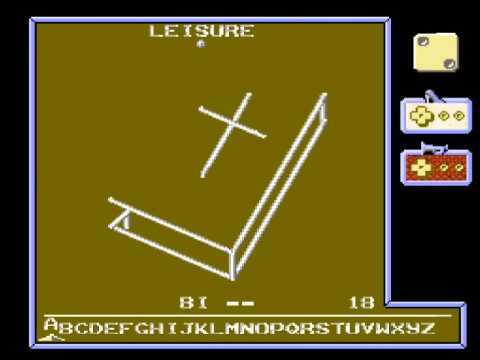 I never liked NES games that had the whole alphabet along the bottom which you had to select the letters individually, which is why board games never worked well on NES. You only have 30 seconds to write the word so prepared to get your best Track and Field fingers ready and mash that left and right button. Often your likely to mis-spell the word or confuse the word with something else that looks similar, and if you get 3 wrong attempts your blocked from the rest of the round, causing you to sit there whilst the other players enviously look on at you knowing you can do something else other than play this crap, like watch paint dry. The colours are very bland and very black, and the graphics although bold, are not the most exciting you’ll find in the NES library. There’s lots of olive greens and brick reds, is perfect for the horticulturalists who play the game, but well-educated, professional people will be doing something more constructive than play this, they’ll be playing Trivial Pursuit, not guessing that a cola can is infact a soda pop can, or whatever the hell it is. To be fair, the music is pretty upbeat and jaunty, which is the game’s one redeeming feature, but with the sound effects sounding like something from an Atari game (which back then is no bad thing, but not for now) but if you liked the music you may as well put on a CD and turn this abomination off. The controls, well there is none, just pressing the A button guess your answer and moving the cursor along the row of letters when you guess. Since Anticipation came out, there has been a plethora of board games on home consoles, all of which will never do the real games justice. Board games are designed to be played in groups on tables with the physical pieces or drawing things in real life. Having your Nintendo draw the pictures is not as fun as it seems, and as it draws as quickly as a snail having coitus, there are plenty of other things to be doing with your time, like eating sandwiches with sewing needles inserted into it or playing a real game for the NES. This game truely ranks amongst the lowest of all the Nintendo games, for its dullness, crude drawings, fast timing slow writing answer-giving, and its all-round badness that makes you wonder why you brought your friends round to play it. If you have people over and want to play games, stick to the traditional routes of Monopoly or Trivial Pursuit, hell break out the Nintendo for Ivan “Ironman” Stewart or 4-player Tennis, but steer well clear of this, if only to keep your role as entertainment provider at your next dinner party. I’m off now to salvage the friendships of those who had to endure this for the review of this game and placing this game where it truly deserves – at the bottom of the rubbish dump just above soiled nappies.